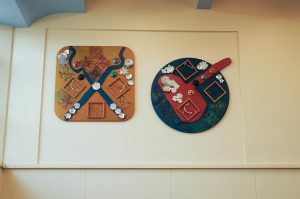 The generous support of Julie MacDonald, High Sheriff of South Yorkshire 2016-17, enabled Yorkshire Artspace to commission Gillian in May 2016 to work with around 90 children to create a permanent artwork for Manor Lodge Primary School that celebrates Sheffield’s past and present as a city of makers. The children explored materials and processes that have been part of the history of their locality at the near-by Sheffield Manor Lodge; weaving, metalworking and pottery. They also carved self-portraits, representing all the past, present and future makers of Sheffield. 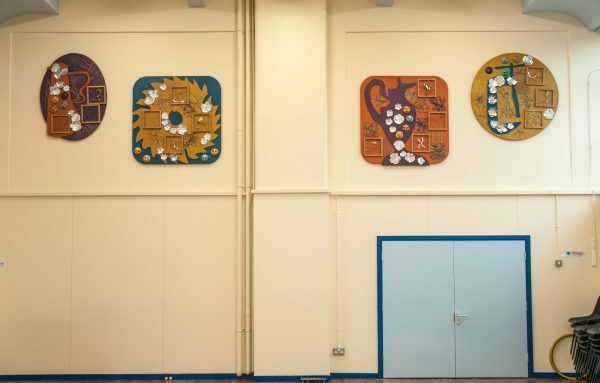 The artwork was launched in December 2016 and is made up of eight wall panels, with individual elements created by all 90 pupils mounted onto them. The designs for the panels are taken from children’s drawings of tools, lent by Sheffield makers and of Sheffield made artefacts. 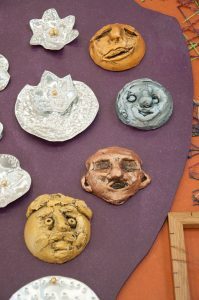 The individual elements made by the children are yarn and wire weaving, chased aluminium flowers and carved wax faces that have been cast into plaster. The panels are installed in the newly refurbished school hall. Gillian would like to think that this project has inspired a future generation of makers.